Shaun Livingston has been through basketball hell, but the point guard just might be the godsend Flip Saunders has been searching the heavens for to lead his team. The Wizards, as was pretty much expected, lost their third game in as many nights 109-95 to the Orlando Magic on Saturday, but Livingston broke out with his best game (most points with 18 and most assists with eight) since his career-changing knee injury in February 2007 . Livingston has barely been with the Wizards two weeks and he appears more comfortable running Flip’s offense than anyone else has been all season. More and more Saunders is turning to the player in his second consecutive 10-day contract to succeed where Randy Foye and Earl Boykins have fallen short. Down 15-13 to Orlando after a Jameer Nelson free-throw, Livingston took the floor at the 6:30 mark in the first quarter and led the Wizards on a 20-5 run to finish the period. During that time Washington went 9-13 from the field with seven of those baskets being assisted upon while not committing one turnover. The Livingston-run Wizards didn’t fare as well in the second quarter, but that was also due to the fact that the Magic finally decided to wake up and play basketball. Brandon Bass and J.J. Redick provided a spark off the bench as the former Dukie scored 10 points in the first four and a half minutes of the period. Of course, seven of those came with Nick Young on the floor at shooting guard and the last three with Foye playing off the ball next to Livingston. Livingston is the newest Wizard, but already has a better grasp of what the Wizards are supposed to do than some of his teammates. This is unlike Randy Foye, who can attempt to be a scorer or a passer, but can’t seem to mix the two and make instinctual decisions on his own. The embattled point-Foye got an even quicker hook in the third quarter with Flip opting for Shaun at the 10:02 mark. After Orlando started the second half on an 8-0 run, Livingston steered the Wizards to a 21-20 advantage over the rest of the period. Five of the Wizards’ eight field-goals in the third were assisted upon. And overall, 16 of the Wizards’ 24 assists came during Livingston’s 31 minutes of action. 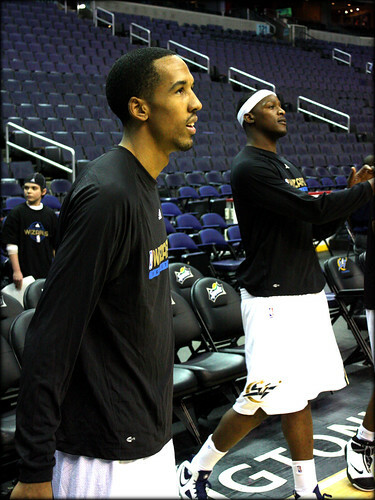 When asked after the game if he would consider inserting Livingston into the starting lineup, Saunders said, “I’ll take a look tomorrow and see, I don’t know.” Not a yes, but also not a vote of confidence for Foye who has started every outing at point guard for the coach since the second game after Gilbert Arenas was suspended. “Randy’s in a tough spot. I’m tough on point guards, you know, I’ve had great ones. I expect a lot out of them. If the team doesn’t function well, it’s kind of like in football, they blame the quarterback. It’s the same way [with point guards],” said Saunders when asked if Livingston’s early entry into the game at the beginning of each half was more of an indictment of Foye, but not before the coach gave Livingston credit for his play. “As point guard you have to have thick skin and it forces you to become a leader. That was Chauncey’s [Billups] biggest thing. He came out and looked to score a lot and wasn’t as vocal. Now he’s probably one of the most vocal guys because he’s had to go through a lot of … I got on him, Larry Brown got on him … so he learned one way or the other,” preached the coach. “There’s a certain mentality to play that position. It’s very difficult to have someone who’s been a predominant scorer and now say, ‘we want you to think “we” instead of “me”‘,” said Saunders, not taking another opportunity to make a jab at Foye (or even Arenas for that matter), but rather resigning himself to the fact that Randy just doesn’t have the tools or the mindset. “It’s like I’ve always said, point guards aren’t made, they’re delivered from heaven,” philosophized the coach who’s notoriously demanding of his lead decision-makers. Livingston shalt not be seen as a divine savior to the Wizards’ point guard woes just yet. At this juncture, his ceiling still might be the backup on a good team. But to even make it back to this point after such a devastating knee injury means that the 24-year old might now have an angel on his shoulder.